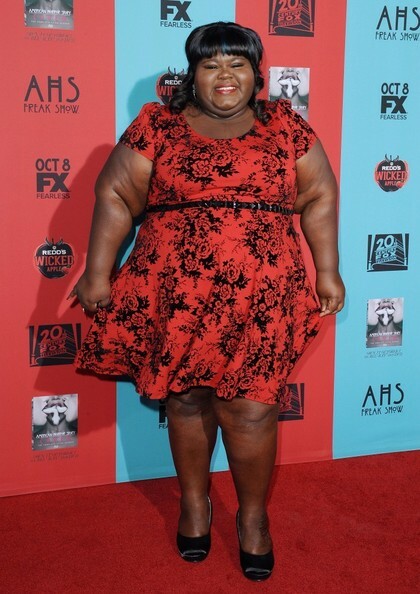 Why Isn’t Gabourey Sidibe the Face of Body Positivity? Recently Madame Noire Magazine asked the question WHY IS MELISSA MCCARTHY THE FACE OF BODY POSITIVITY AND NOT GABOUREY SIDIBE? It’s a fair question and I’m going to hazard my own guess. Melissa’s good fatty to Gabourey’s unapologetic fatty makes for better Hollywood stories. Society and the media love fat people as long as they’re trying to lose weight and conform to what is considered aesthetically pleasing. Recent articles on Melissa’s new movie, Spy, gushed more about her weight loss than her acting. Either that or the upcoming clothing line, Melissa McCarthy Seven7, which acknowledges that “people don’t stop at size 12” but apparently believes that we don’t exist at any size past 28. It’s OK to be fat so long as you’re not too fat. Another guess that I’m willing to hazard is that most (if not all) of the tops and dresses will have sleeves. When Bridesmaids came out there was a huge fuss (no pun intended) because Melissa’s character was the only one wearing sleeves. At the time fat acceptance and body positive activists cried fat shaming… how dare you cover up her arms?!!! However, if you look back at Melissa’s many public appearances, she never, ever bares them. Go ahead, do a search and please let me know if you find any photo where she’s sleeveless. Instead of wishing that her body were “magically” smaller, Gabourey finds inspiration in the negativity as described in a speech she gave at the Ms Foundation Gala last year. So why isn’t Gabourey Sidibe the face of body positivity? Because that beautiful face is attached to a body that society and the media would rather she change… as good fatties do. I agree Melissa is definitely less body positive because she does talk about weight loss BUT she is also in more films than Gabourney so that may also have something to do with it. I think there is also a thin line between being obese and unhealthy versus chunky and healthy. While Gabby may not be in as many movies as Melissa, she appears in highly rated television shows like American Horror Story and Empire. Also, health wasn’t part of the discussion because it’s for no one to discuss except them and their doctors.